As far as I'm concerned, construction may as well be brain surgery. I am consistently amazed when I see what a couple of skilled guys can accomplish in an afternoon. 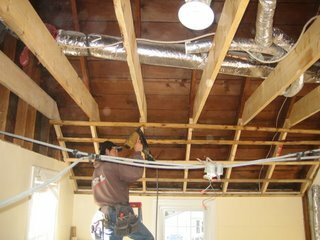 Install a steel beam in the ceiling? No problem. Relocate an exterior door? Piece of cake. Watching our carpenter Marius and his associate Joe do it reminds us why we are not DIYers. Don't get me wrong, for some, doing the weekend warrior thing makes sense. But for Bob and me, it would be the worst decision we could make. The two of us are often outwitted by the simplest of home improvement projects (see past failures: relocating speaker wire about 10 feet on the same wall, replacing outlet cover and myriad other fiascos too embarrassing to admit.) I figure, if Bob gets hired to do chip floorplanning and one day, God willing, I will once again be hired to write a smokin' marketing plan, why should we expect that our talents should extend beyond the realms in which we excel? More simply put, just as I wouldn't expect Marius to try his hand at our jobs, why oh why would we try to do his? Many have told us there's money to be saved by us doing at least part of the job. But I have my doubts; I envision us doing more harm than good, as in, "Uhh, the house is rocking... do you think that could have been a load bearing wall?" I'm reasonably certain the best thing for all involved is for us to leave it to the pros. 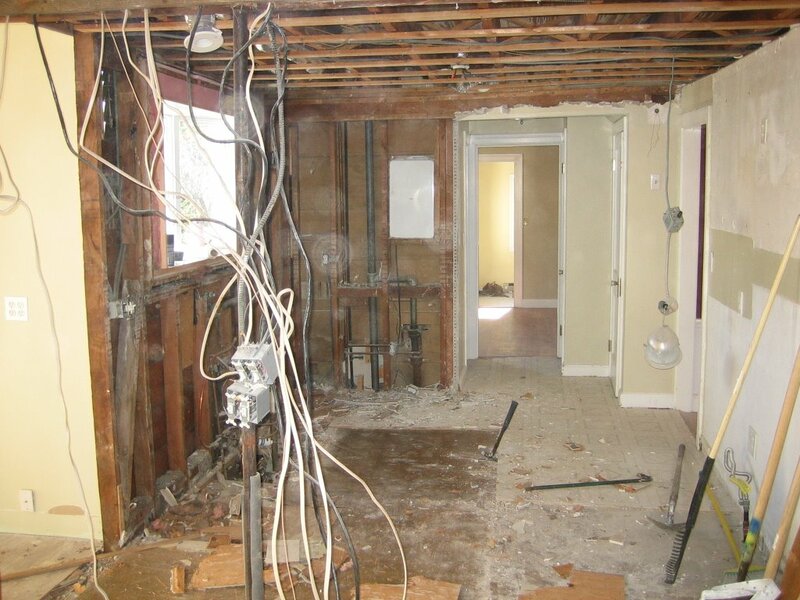 We take the immortal words of Mike Holmes seriously, "If you can't afford to do it RIGHT, then you have to WAIT." Besides, if you looked that good in Carhartt overalls, I'd listen to you too. It took a few weeks of demolition and another couple of weeks of framing but now we've officially turned the corner and the state of affairs at the house is steadily improving each time we visit. For a while there was chaos everywhere with unidentified wires snaking around and steam pipes running from ceiling to floor where once there were walls. But now the mess is disappearing and in its place we're beginning to see what's to come. There's plenty more work to do but it looks like we may be able to move in mid-January. That means it'll be a non-traditional Christmas here in the apartment where the blinding whiteness isn't from the snow outside but from all the glaringly barren walls. Thankfully, it doesn't bother Sam in the least, in fact he loves to play the drums on the giant moving boxes that litter the apartment. It's amazing how much stuff one can live without when it's thought to be temporary. Never in my wildest dreams did I think we'd be here so long but I'd certainly rather live here than amidst the dust storm currently raging inside our house. I also consider myself fortunate that this year Sam hasn't quite figured out the logistical challenges Santa will face on Christmas Eve when he tries to figure out how to get in this apartment without a fireplace. Rest assured next year it'll be another story; the stockings will be hung by the new-and-improved chimney with care.